A dry (24 degrees), very bright day with 30 mph gusts.. Challenging to say the least.! With the carp still spawning it was a tougher day than usual, and the wind didn’t help those targeting silvers on the pole either. Some nice weights were recorded on both waters, with lots of nice ide, skimmers and a few carp caught. On Wallace Lake, Steve Royle drew hot peg 32 in section 1 and with the wind blowing into that corner it was a question of how many? would he catch..! With the carp not responding to his pole line, a switch to the pellet waggler produced a good number of carp. Steve weighed in 85lb 12oz to win the section and Overall match. Second in the section was John Callaghan with 36lb of silvers caught on maggot/worm on the pole. Section 2 was a little closer, with Chris Yates winning the section with 32lbs, a mix of small carp and silvers on pole/tip rod. Myles Watt finished a close 2nd with 29lb 10oz, mainly silvers caught on the pole. (. We think John Williamson fell asleep on peg 47.).!! QUEENSBERRY WATER section 1 and young Rob Swan done the business on peg 17 with a few good ide and skimmers on pole/maggot, along with two big carp ( 1 was 10lbs.) on pellet waggler to win the section with 46lb, with Symon Willan a respectable second with 30 lbs on peg 19. 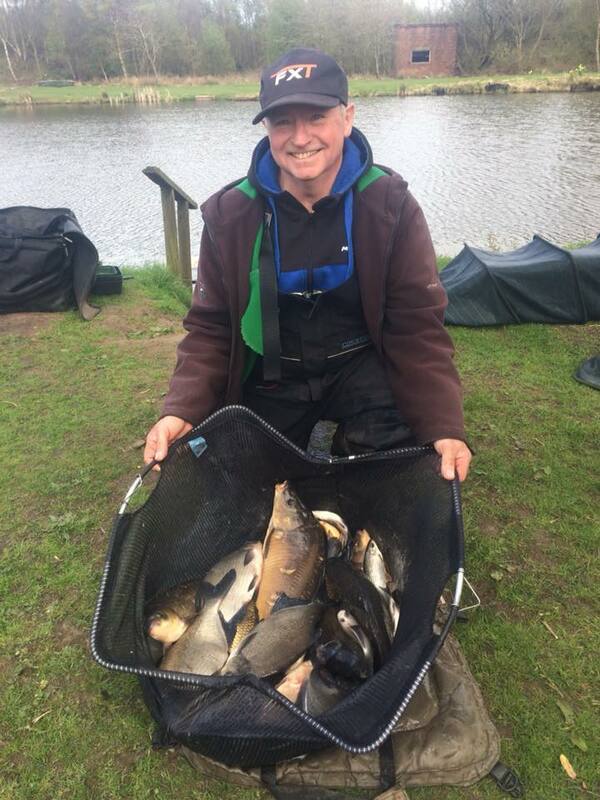 Section 2 was won by Ian Whitson with 41lbs 8oz, a mix of ide and skimmers on pole/maggot. Gary Black finished a decent second with 31lbs, again a mix of skimmers and ide on the pole. Well done to all the ” framers” today on a challenging day for pole fishing..! BROOM SERIES ROUND 2 next Sunday, to be held on Queensberry Water and Wallace Lake.